Asus has decided to play the waiting game to determine pricing for its upcoming Windows 8 tablets, reportedly looking to take cues from Apple's pricing model. According to a Digitimes report, Asus president Jerry Shen stated that the company plans to use the price of Apple's new iPad as reference for its own Windows 8 tablets. The comment is somewhat ambiguous, with "reference" possibly meaning a straight imitation of the iPad's price or simply using it as a rough guideline for a potential price range. However, it seems Asus is aiming at the high end of the price spectrum. Shen further commented that if Microsoft prices its Surface tablet at $199.99 it could be a difficult hurdle for Asus to overcome in the market. 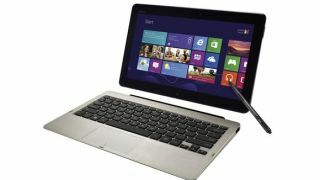 Asus recently re-announced its duo of Windows 8 tablets, the Asus Vivo Tab and Asus Vivo Tab RT. Both tablets will look similar from the outside, featuring an 11.6-inch Super IPS+ 1366x768 10-point multi-touch display, an 8MP rear facing camera with autofocus and LED flash, a 2MP front facing camera, and an NFC sensor. Internally, the Asus Vivo Tab will be more of a productivity machine, running on an Intel Atom CPU, 2GB RAM, and a 64GB solid state drive. The Asus Vivo Tab on the other hand will function best as a mobile entertainment center, running on a Tegra 3 chip and half the storage space. Both Asus tablets will release on Oct. 26 alongside the launch of Windows 8 and Microsoft's own surface tablet. While there isn't an official price yet, the company's comments have at least set expectations well above the $200 range.